What comes across from the passage of Senate Bill 1867 is fear, palpable fear. What are they afraid of? Losing the US to home grown terrorists? And under what circumstance would this occur? Phrases like "indefinite detention" of American citizens cast suspicion on the claim that this is a bill intended to protect the US from another 911 type attack. The US has a working court system, and Gitmo under US military rule seems without serious challenge. Under what circumstance would the US be so overwhelmed by home grown terrorists that the US court system and federal agencies would not be able to deal with the issue? That the vote on this Senate Bill was 93-7 in favor of passage is another astonishing fact. This palpable fear crosses political boundaries! Given that the wording in the bill runs amuck of the Constitution - the right to bear arms, the right to a speedy trial, and the casual deployment of the US military of US soil - it would not withstand court challenges as it stands. What has happened to cause the US Senate to be so gripped by fear that it, as a body, runs amuck of the Constitution? Clearly it is not an economic depression or the national debt, both of which have been long running and caused no more than argument in the Senate about jobs bills and lifting the debt ceiling. This is a panic induced by a sudden and widespread awareness of our predictions on the pending pole shift, the reality of the presence of Planet X in the inner solar system, the accuracy of our predictions in the past, and how our 7 of 10 predictions are rapidly proving correct. The New Madrid scenario has the Senate, almost to a one, in a panic. They don't consider this hypothetical, they now consider this a pending reality. Europe, their ally, will be devastated but China, the sleeping giant, will not sustain a 7 of 10 disaster. Might China try to invade? Might the Mexican cartels attempt to overrun the southwest? Might US citizens refuse to pay taxes? Asked to explain themselves, the red faced Senators could not. What are they to say, that Planet X exists? That ZetaTalk is correct? That they are aware of the dangers and personally preparing but are denying the public information about the real threat? That they want the citizens to attend to their jobs, and if they attempt to prepare for a coming cataclysm instead, they will be arrested and detained indefinitely? What you are seeing here is a panic in the cover-up. This is just the tip of the iceberg, in what is coming. I just saw this article and I was wondering if the Zetas could comment on the plans behind this apparent attempt to acquire all gun manufacturers? Is it related to attempts at martial law or is this Cerberus company on the side of the masses and truly in support of the second amendment? I understand that guns will be useless in the aftertime due to exploding or corroded ammo (or just plain lack of it), and/or taken from the good-hearted to be used against them, but it would be good to know what to expect in the meantime - "hands of man" considerations noted. [and from another] How Freedom Group Became the Big Shot [Nov 26] http://www.nytimes.com/2011/11/27/business/how-freedom-group-became-the-gun-industrys-giant.html In recent years, many top-selling brands - including the 195-year-old Remington Arms, as well as Bushmaster Firearms and DPMS, leading makers of military-style semiautomatics - have quietly passed into the hands of a single private company. It is called the Freedom Group - and it is the most powerful and mysterious force in the American commercial gun industry today. To keep growing, the Freedom Group has expanded its sales staff in the United States and increased its business internationally. It has sold weapons to the governments of Afghanistan, Thailand, Mexico and Malaysia. Control of the gun industry can be interpreted in many ways. For some, it signals an intention to gain control so the industry can be shut down, a form of gun control from within. For others, it merely shows an intention to gain control of an industry, in order to raise the prices for those engaged in wars, which can be fomented by outsiders for such profits. The name - Freedom Group - implies yet another agenda, that this group is trying to control the industry in order to keep it afloat, to provide arms to the citizenry. As with the actions of so many with connections or wealth, the Freedom Group is revealing their knowledge of what is coming. If world peace, and peace within nations, is currently controlled by governments and their militaries, what will happen when borders are shattered, military operations disrupted and disbanded, and communications impossible? Those who are armed can not only defend themselves, they can press their authority on others, or so the logic goes. If black gold - oil - will be more valuable than gold in the future, in the eyes of the Bush family, why would armaments be any less powerful? This will not work as planed, for the many reasons we have explained. Guns are more dangerous to those holding them, to the group holding them, than to outsiders, as statistics relay. Add to this mix the amount of insanity that will occur as a result of the pole shift - 43% of survivors going insane to some degree, primarily with PTSD - and you have a volatile mix. Looting and roving gangs, under official or other auspices, will soon find their ranks decimated. Stocking guns and ammo is as volatile a mix as storing explosive fuel. We advise against it. . I would like to ask such a question. Recently, 30 November, my friend from Tbilisi, Georgia, made the photo (see below). In the photo during sunrise can clearly see three UFOs. Could our friends to answer - is this an accident, that the objects are arranged in this manner? Maybe it was message for the inhabitants of the city or perhaps something another? Tbilisi lies in the middle of the stretch zone that has caused the reservoir at Kiev to sing due to vibrations. A quick look at a relief map of Georgia shows the country pulling apart, right through Tbilisi. As with all UFO displays, telepathic messages are delivered to those entranced and watching. Stretch zone accidents are silent, not accompanied by quakes in the main, but just as deadly. Can the Zetas give a comment? http://www.youtube.com/watch?v=SF1IOhqMrGc&feature=g-all On December 01, 2011, planet Venus was what it looks to be blinking, I get some videos from November 07, 2011 to the date when Venus happen to be unusual, and Jupiter and moon was looking normal, but some thing was wrong with the planet Venus. The Full Moon on November 10, was showing an issue that didn't happen before on the Moon. This video is made from 11-07-11 to 12-01-11 in Houston Texas. To see Jupiter on November 17 you are looking away from that part of the sky where sunlight is streaming through the vast dust cloud of Planet X. Where Planet X is coming at the Earth in a retrograde orbit direction, from the right hand side, Jupiter is viewed toward the left. To see Venus on December 1 one looks to the west at dusk, thus looking directly through the dust cloud toward Planet X, the light thus distorted. To see the Full Moon on November 10 one must look directly east in the dead of night, again looking in the direction of the vast dust cloud of Planet X, which is wafting between the Earth and Moon. What you are seeing with this distortion, the wavering and waning light, is bending of light rays as they travel through the charged dust cloud! Suddenly, and without explanation or apology, the US is openly preparing for disaster. This did not occur after the Katrina disaster, so is clearly not a reaction to recent events. If a preparation for a New Madrid disaster, which is vaguely predicted by officials for sometime in the next century or beyond, then why the sudden sense of urgency? The public is not noticing these efforts, as they are kept out of the mainstream press. But for those tracking such revealing plans and actions, the meaning is clear. The US government, FEMA, expects the New Madrid disaster to occurs soon, and is saying nothing to its citizenry about it! Is this an Alien Spacecraft Parked Next to Mercury? [Dec 8] http://www.dailymail.co.uk/sciencetech/article-2071099/Is-alien-spacecraft-parked-Mercury.html A gigantic object the size of a planet has appeared on astronomers' screens lurking near Mercury, with UFO hunters around the world wondering whether it's an alien ship. The object appears from nowhere in a sequence of images of a coronal ejection from the Sun, taken by a NASA telescope. As the flare races past Mercury, a huge round object appears next to it - but NASA scientists insist that the object is merely a result of the way the images are processed. The image from the telescope was analysed by the United States Naval Research Laboratory, with engineer Nathan Rich explaining that the 'object' is actually the image of Mercury from the previous day. Moving objects, like planets, are more difficult to remove. [and from another] Mysterious Planet-Sized Object Spotted Near Mercury [Dec 7] http://news.yahoo.com/blogs/sideshow/mysterious-planet-sized-object-spotted-near-mercury-154443870.html Is a giant, cloaked spaceship orbiting around Mercury? That's been the speculation from some corners after a camera onboard NASA's STEREO spacecraft caught a wave of electronically charged material shooting out from the sun and hitting Mercury. [and from another] Giant 'Death Star' Spotted in Space [Dec 8] http://www.thesun.co.uk/sol/homepage/news/3986191/Giant-Death-Star-spotted-in-space.html The round 'craft' is as big as a planet and appeared from nowhere in images captured by a NASA telescope. 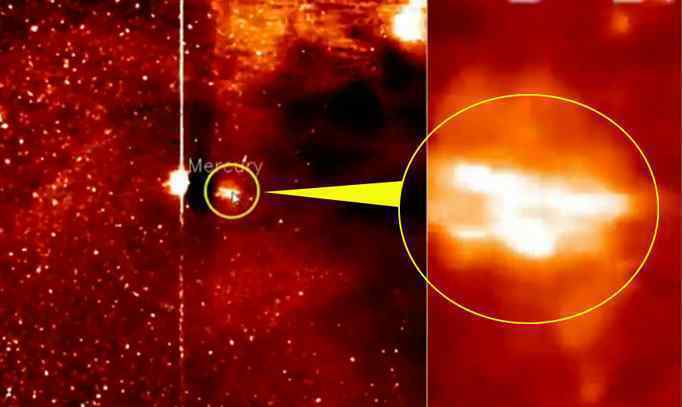 The Heliospheric Imager-1 telescope was taking pictures of a coronal ejection, a giant eruption, from the sun when the mysterious 'ship' turned up in a series of shots. NASA has been struggling with evidence of Planet X and its Moon Swirls and vast dust cloud appearing in SOHO and Stereo images since 2003, without success. When the Earth was blocked in its path by Planet X in December, 2003, the Earth then stalled in her orbit, NASA dealt with this by simulating the background of stars and planets in the images. They started out air brushing evidence of Planet X out of the images, programmed cut-and-past operations that showed obvious edit lines. When the Planet X complex came closer, wafting about so the location of objects was not certain from day to day, NASA dropped the effort entirely and just allowed the Winged Globe and the various Moon Swirls to appear on the images. No comment, was their response, or perhaps calling the individual moons "compression artifacts" when they showed up. At present, what one sees on SOHO and Stereo images is a contrived star background, inserted planets passing to and fro, and real activity in the Sun. The Planet X complex is brushed out as much as possible, but mostly ignored. Now, as occurs during all solar cycles, we have arrived at the solar maximum, when an occasional CME might occur. This is insignificant except that sunlight reflecting off the dust cloud and the dust clinging to the Moon Swirls has yet another source of light - the CME itself. When the CME envelopes an area, the airbrushing programs are turned away from this area, as activity in the Sun can be seen by amateurs and the images must correlate closely with what has been seen by amateurs. Thus illuminated by the CME, and not reduced by any attempt to airbrush the object away, a tube like cluster of Moons appears dramatically. The programs were not reinstated in time to eliminate this Moon Swirl reflecting light from the Sun and the fading CME, a NASA blooper. Since the pathetic attempt to explain the object, as Mercury itself lingering from a previous day, will hardly impress the common man, the suspicion that there are objects between the Earth and Sun has been planted in many minds. All to the good, and the media exposure just the start of such speculation. .